By now you should have learned the value of what we call Local SEO. It’s the ability to add content to your website that spotlights your location. Without Local SEO you’re shooting in the dark when it comes to getting those choice spots in the top Google results pages. 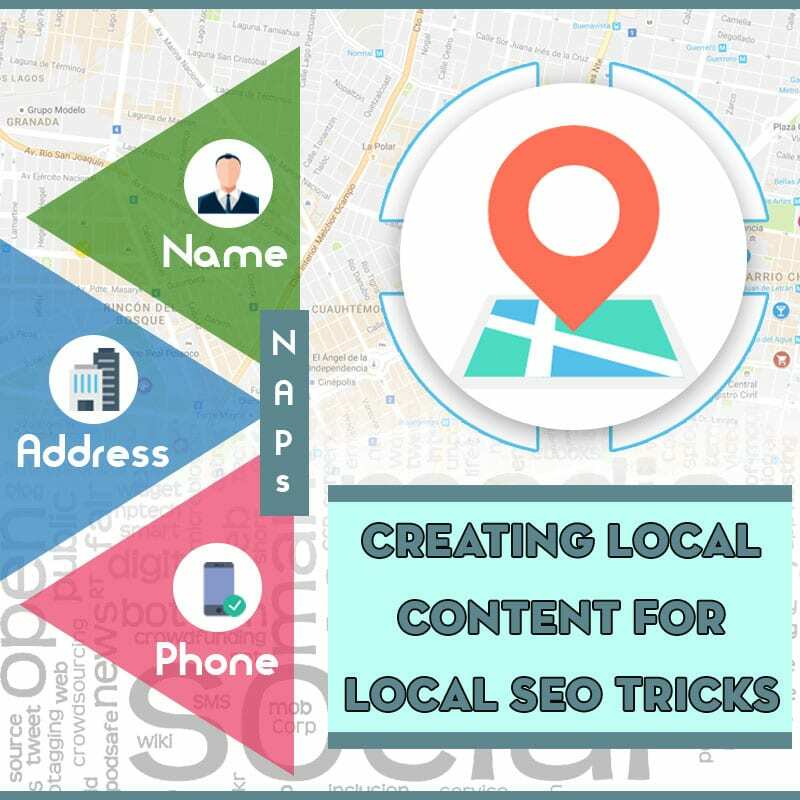 Local SEO isn’t difficult at all and we’ll look at some goodie tricks you can easily use to boost your Local SEO presence that puts your competitors in check. The first thing to do is remember that no matter what goods or services you’ve got just telling people you have or do them is not enough. They have to be able to not only know you exist but that you’re beneficial in the fact that you’re nearby. This doesn’t just go for your present shopping location but in any location that has goods and services the surfer might need especially if they’re shopping remote for a friend or family member. Spotlighting is making sure that on the important page views of your site that you emphasize your location. You ca do it with catch phrases like, “From sunny Armpit, Arkansas” or “Located in the historic district of Pimple Head Kansas”. The names might be funny but you get the drift. In all cases, contact info must be prominent on each page of your site as Google indexes pages, not websites. Only on the pages where you needed to emphasize more do you spotlight. On all other pages you just make sure your NAPs are clearly visible (Name Address Phone). Showcasing is like spotlighting but instead you really show of your location. Ina case like this, dedicate a page or two that features a local event of note. You can use whatever you wish going back as far as you wish. If a group participates in a community event annually, then attend such an event with camera in hand, shoot footage, pics or even interviews of the participants. This content you then showcase on your webpages. An example being, if there was a famous battle during the Revolutionary War nearby and it’s celebrated every year with officials and such, attend, film, video, do interviews and try to get the keynote speakers. This way you can then say something like, “Joe’s Sporting Goods attended the Battle of Bunions” at thee 240th anniversary of that historic Revolutionary War engagement”. Now, people interested in such venues will hit your site regardless of what you’re selling but at least they’ll know you’re here, active, and have content that is ripe for social media SEO. The popular term ‘props’ is short for ‘giving proper dues or credit’ to someone who has achieved success. Content like this you can go on forever using Local SEO and make tons of friends who can become future clientele. An example of this would be your local police chief, mayor, city manager, baseball coach at the high school or even clergy. Just show up with a camera and let them know that your company appreciates what they do and would they take a minute to say “hi” to your audience. You might offer a discount or donate to their favorite charity in exchange. This way not only do you get someone of caliber endorsing themselves, but you as well. An example would be you videoing the local city manager and thanking him or her for their service. You would then put on your site something like, “Joe’s Plumbing from Smith Street in Jawbreak, Tennessee salutes city manager Bob Cobb for his dedicated service to the community. We at Joe’s Plumbing take pride in our community and are always willing to provide the kind of service and leadership that our city manager Bob Cobb does.”. Now, whenever someone is looking up for Bob Cobb they’ll hit your webpages where they’ll see the tribute and engage in social media via your blogs, Facebook, even Pinterest. As you can see there are many facets to this Local SEO diamond and it just takes some elbow grease and imagination to make the best of it. Companies like Affordable SEO Company are experts at Local and Organic SEO. Check them out to get your campaigns running professionally with the kinds of results you can count on. Previous PostPrevious What Is Meme SEO?